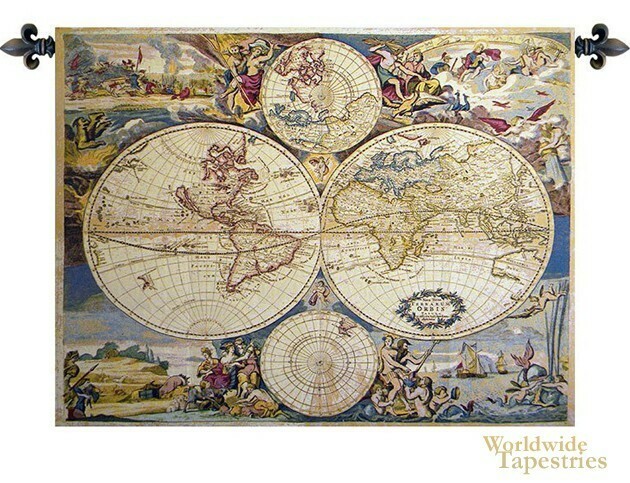 Planisfero Italian world map wall tapestry is based on the work of cartographer Joan Blaeu from 1565. We see in this world map the contours of the world known at the time, with parts of the coastline of Australia and North America missing, and richly decorated with mythological figures and scenes to make the map as much art as science. In the 16th century, cartography was as much about the artistry as well as the maps. Planisfero tapestry is backed with a lining and a tunnel for easy hanging. Note: tapestry rods and tassels, where pictured, are not included in the price. Dimensions: W 54" x H 42"